My friend Rita of Jewel School Friends came up with the idea for a Window Shop Holiday Hop. Doesn't that sound like fun? Hop from one great "shop" to another and see what they have to offer for the upcoming holiday season. Who knows, you might just find something to add to your wish list! Without further ado, I'd like to welcome you to my shop. You can find it on Etsy at Knot Just Macrame. I've been filling it with some great pieces. Over here are my earrings. These are a few of the ones I have on hand at the moment. I particularly like the green pair - they're almost a wasabi green. Or maybe chartreuse. Definitely not your run of the mill green, either way. And the blue pair? They match a bracelet you can find over in the bracelet section. Or maybe you're looking for a necklace? 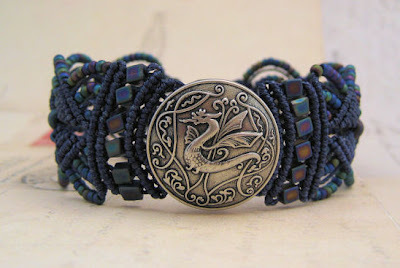 Have you seen these made with Kazuri beads? If you're not familiar with Kazuri beads, they are handmade, hand-painted ceramic from Nairobi, Kenya. Each bead is shaped by hand, by one of the 350 local women employed by Kazuri. The beads are then polished and kiln fired, painted and fired again. Kazuri is a member of the Fair Trade Act. I love the freehand, organic look of them. If one of those doesn't catch your fancy, you can find lots more necklaces here. I'll leave you to look around on your own. Take a few minutes to check out all the little nooks in my shop. I have a bead embroidered snowman cuff sure to make you smile, a couple fun Day of the Dead style pieces and even some Husker designs for Nebraska fans. Don't see just what you had in mind? Love the design, but need a different size or color? Shoot me a message and I'll see if I can make it happen for you. I'm handy like that. The hand painted lucite bracelets are fantastic! Continued success throughout the holiday season and well afterwards. Holiday Blessings. awww... thank you, Marla. I hope you're feeling better! Sherri- Your micromacramé pieces are so pretty but I must admit that my fingers ache just imagining the work that they take! I wish you a wonderful holiday season! Best for a good holiday season! I admire your work regularly, so please don't make me pick favorites now. Sherri what wonderful pieces featured here. You always do such great work! I too love Kazuri beads. I love the fact that they aren't "perfect". Best wishes for a happy holiday season! I just love your work! and I didn't realize you were doing lucite as well - gorgeous! I've been a fan of your work for a long time -- I get so tangled in macrame that all I can do is a square knot and a half square knot. Lots of admiration! Beautiful pieces Sherri. I love them all. Those earrings are fabulous. Just the right size and I know they do not weigh a ton so they are wearable. Love all the colors too. Wonderful post!! Love your jewelry -- gorgeous and simply the BEST!! Gracia with all my heart for sharing your beautiful shop with us!!! Awesome Holiday jewelry, and I knew nothing of Kazuri beads. Thank you for teaching me and creating thoughtful, empowering, exquisite jewelry art!